If you're an enthusiastic metal listener, or been around enough to experience it, you probably have a band that broke up decades ago but wish was still active. 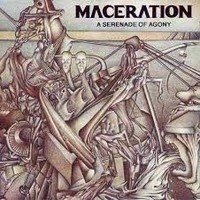 For me and many others, MACERATION are one of those bands; a Danish/Swedish death metal act featuring members of INVOCATOR, and also the esteemed Dan Swanö (Day DiSyraah) on vocals. This year, May gave us a reissue of their full-length, "A Serenade of Agony"; quite frankly a must-have for fans of old-school Death Metal. The lengthy and mature opening track draws us with false pretenses as we are smacked in the face with riff after gritty, razor-sharp riff. The sound of the guitars is muddy and unforgivingly grating, perfectly accompanied by top-notch drum-work and surprisingly quality vocals; Dan's delivery is splendid, and is not at all diminished by the overall recording quality. In essence, this track is truly evocative of 80's Death Metal. "The Watcher" is perhaps one of my favorites; interestingly featuring a somewhat different mastering and overall sound, the powerful introduction paves the way for a memorable and strangely catchy verse riff. This track is perhaps one of the best expressions of the band's creativity; the arrangement is subtly complex, and the odd progressive flair adds to the experience. "Reincarnation/Time Flies" may well be the band's fastest and most aggressive, lest the hypnotic groove-ridden and exceptionally well-written intro riffs subside in opening for a torrent of riffs, bearing a molecular edge. Endearing mid-tempo sections show themselves, often permeating frantic and chaotic guitar solos. This track likely contains more guitar solos than most other tracks on the record; in no way does it let up. "The Forgotten" is truly evil-sounding at its core, bringing with it an inescapable air of melancholy built upon a strong showcasing of riffage. The lead work is strongest in this track, often evoking a nod towards Death. As far as I am concerned, this re-issue is a must-have for fans of old-school death metal, especially fans of the often-overlooked Danish extreme metal scene; those who identify with the early works of INVOCATOR would and should love at first listen.